A pool table is a very popular addition to any game room. They provide hours of entertainment for all ages and look great too. There are factors that you need to consider to make sure that you are making a good decision on the right pool table when you purchase one. We looked at the 10 most popular pool tables on the market and considered them for construction, durability, quality of materials used, size, extras, felt quality, sturdiness, cost and customer feedback. The three pool tables reviewed below came out at the top of the list for all the categories we considered. Any one of them would make an excellent addition to your game room. There are helpful guidelines that you should follow when looking that will help you be certain that you’re buying the best pool table for your needs, preferences, home size and more. With all of the choices available on the market when it comes to pool tables, unless you know something about them, it’s easy to become overwhelmed. We’ve provided two useful tools that will help you sort through the choices so you can make the right decision much easier and feel confident in the pool table you choose. You don’t want to spend a larger amount of money on a pool table only to discover that it was not what you were hoping to get. Taking the time before purchase to understand the features and factors that make a good quality pool table can save you time, money and the disappointment of spending money on a substandard pool table. The reviews below and the buyer’s guide following will give you all of the information you need to choose a good quality pool table that everyone will enjoy playing for years to come. This beautiful Fat Cat Frisco II Billiard table provides 7 ½ feet of enjoyment and style for any game room. The MDF accuslate play-bed, K66 rubber bumpers and 6” wooden side rails are just a few of the excellent features that make up this excellent pool table that is perfect for both competitive and recreational play. The 1” Accuslate play surface is designed to resist any warping that will ruin the table and it is backed by a 7 year accuslate surface warranty that stands behind the quality of the construction. The hazel-tone color of the wool blend play bed cloth looks beautiful with the attractive braided accents and maple finish so your table not only plays well but it looks beautiful too. There are 6 French-style drop pockets that are reinforced for strength and enhance the Frisco’s classic great looks. There are braided strands hanging from the top of each pocket which provides a decorative accent curtain that surrounds each one. Along the rails you will find 18 pearlized diamond sights that are inlaid into the wood which helps the players line up their shots perfectly. The pearlized tone of the accents complements the coloring of this unique and striking pool table. The beveled legs have hidden leg levelers that will ensure an even playing surface and enhance the table’s stability so play is not affected. The Frisco comes with 2 pieces of cue chalk, 1 triangle made of resin, 2 hardwood cues that are 57” each and 1 complete set of competition grade billiard balls. If you’re looking for quality and regulation sized play, the MD Sports Traditional Billiard Table with its square legs will fit the bill. This table provides 8 feet of high end play. The high quality design features beautiful wood grain finish that is durable and long lasting. The slid, sturdy construction is supported by strong leg construction and design. The felt on the play-bed is a blend of polyester3 felt and 35% wool blend for a smooth uninterrupted roll. The drop style pockets are reminiscent of game parlor tables. The top rails wood grain design enhances the look of the table even more so it looks as good as it plays. The MD Square Leg Billiard table comes with a full set of competition grade billiard balls, 2 cue, 2 pieces of chalk and a triangle so you have everything you need to play once the table is set up. Assembly is required. This makes the perfect addition to your high end game room and will provide years of fun and entertainment for pool players of all ages. Not everyone has room for a regulation sized pool table. That is one of the many great things about the Mizerak Dynasty Space Saver pool table. It measures 6 ½” feet which is perfect for smaller game room areas. The convenient leg levelers ensure an even, precise playing surface with minimal hassle. It features an automatic ball return that enables players to get started on the next game quickly. You will get an even, consistent roll thanks to the double-sealed MDF play bed that is warp resistant. The attractive green nylon provides game parlor good looks, long last durability and smooth play. There are rubber cushions that are in place around the edges of the play-bed which make for speed and accuracy as well as excellent rebound action. The laminate exterior that has sleek bamboo laminate will look great with any décor and the black corner posts and caps compliments the bamboo creating an attractive, stylish look that you will enjoy looking at as much as you enjoy playing it. The table is strong and sturdy thanks to the cross supports that increase the stability of the table and prevent it from wobbling at any time. The Dynasty Pool Table comes with a full set of billiard balls, a cue ball, a plastic triangle, 2 blue cue chalks, a brush for cleaning the table surface and 2 Mizerak cues. You’ll have everything you need to play and enjoy your pool table. Assembly is required and general takes a couple of hours to put together. Two people will have a much easier time putting the table together. Buying a pool table is a big purchase and you want to be certain that you are buying a quality table that you will love once it is set up and ready to play. There are a lot of different pool tables on the market to choose from with differences in felt, leg style, size and finishes. 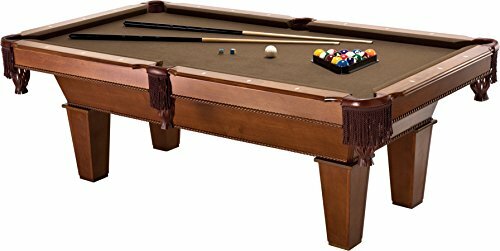 All three of the top rated pool tables that are featured above are excellent quality tables from well known manufacturers. 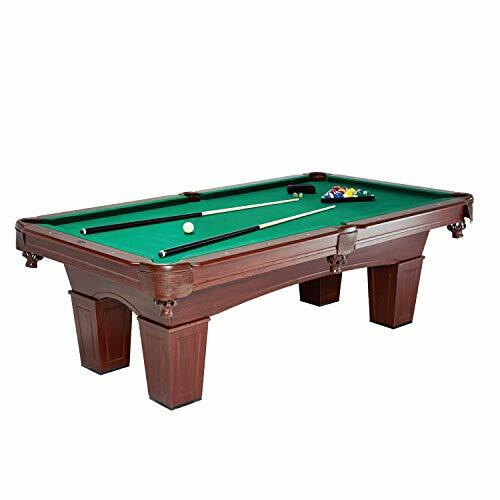 Whether you need a smaller table for a smaller place like the Mizerak 6 ½” billiard table or you love the fancier design and look of the Frisco with it’s gorgeous braided pockets, or the full sized MD with its 8 feet of high quality playing space, you will get an excellent quality table that will provide years of entertainment and enjoyment. Continue reading our buyer’s guide below to learn more about how to choose the right pool table. We’ve provided you with the information you need to sort through all the choices and find the perfect pool table for your game room, preferences and playing style. The right information makes choosing this larger ticket item much less stressful. You’ll feel confident that you have chosen well. There are several things to consider when you are searching for just the right pool table for your needs. When you take the right factors into consideration, you will be able to choose the perfect pool table for your specific preferences and needs. We’ve listed the important considerations below. There are several components that make up all pool tables. When you start looking for the right pool table for your needs, you will need to take these different components into consideration and take a look at each of them when deciding between the different pool tables you are interested in. Understanding the different components will help you be more adept at evaluating the pool table’s quality. Legs – The best material you can look for, for the legs of your pool table is solid wood. There are tables that have curved and carved designs on the legs but that does not have a bearing on how the table plays. A solid leg base provides a lot of stability for the table so it is sturdy and solid while you are playing. Frame – The frame of your pool table is also an important feature to look at. The structure of your table is what all the other components are attached to in one form or another. Decades ago, pool tables were only made with solid wood frames but that is not the case anymore. Today, you will find tables that have fiberboards with medium density making up the frame of your pool table. Game play is very close to the same for solid wood frames versus MDF frames so it comes down to personal preference. The same is true about straight frames versus tapered frames which also come down to a personal preference decision on which they like better. The durability and stability is the same for both. The best quality frames are supported with a central beam that runs the full length of the table and is additionally reinforced by two crossbeams. Slate – The play area of the pool table is the slate. This area got its name from the single piece of slate that was commonly used to create this area. Slates come in different thicknesses and the thickest of these is the one you want to look for, which is 1”. There are also ¾” and 7/8”. Wood backing on the slate is a personal preference. Some like it that way and some don’t. ¾” slate tables are less expensive but are also less in quality, durability and accuracy as well. Rails – You want the rails of the pool table to be made from solid wood. This allows the perfect amount of bounce. The rails should be bolted into place with bolts that will run through the frame into the slate. This guarantees that the rails are firmly in place and the cushioned edges give the balls excellent response. Plastic – Plastic pockets are usually on cheaper and poor quality tables. They are not very durable and tend to wear out quickly. Rubber – Rubber pockets are used for commercial tables and are much more durable than the plastic varieties. Leather – You will find leather pockets in a lot of residential tables. They not only look a lot better than the other choices, but they are the most durable as well and will not crack or split like plastic will. The look of the pockets is oftentimes added to with shields of some kind or fringe. There are also rims that you can get, which cost a little more but add to the stability of the pocket. Felt – Felt is available in many different forms. You can choose a wool-blend felt or a worsted version which is much better at providing excellent game play, has a lot better resilience, and can be cleaned easier as well. You want to look for felts that are attached by a tack strip. A professional can fix a felt that has folds in it but if there are any tears or holes, the felt will need to be replaced completely. Pool tables are a very popular addition to home game rooms all across the United States. There are many different varieties of pool tables to choose from and those varieties include felt color, finishes, pocket styles, size of the table and much more. With all of these choices, it may feel very confusing to try and decide on the right pool table for your home game room. The information in this buyer’s guide is designed to help you understand the different components of a pool table and what you want to look for regarding those components. One of the first things you need to know when it comes to purchasing a pool table is the size space you have to work with. 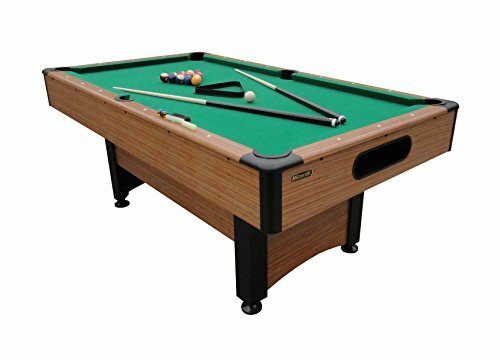 If you want a pool table but don’t have a lot of room, there are smaller 6 ½ foot tables that will work great in that smaller space while still providing you with the ability to play a game you and your family enjoy. There are also larger tables that are available if space is not an issue. The main thing to remember is to look for quality construction, sturdy leg design, solid wood rails, nice slate play-beds and other quality parts. The higher quality you can afford, the happier you will be and the longer you will have your pool table.